The threat of global warming has attracted considerable attention from policy makers around the world. We analyse public support for environmental protection and the main drivers of support in Australia and cross-nationally using survey data from the International Social Survey and the Australian Survey of Social Attitudes. Support is measured as a series of trade-off questions based on willingness to pay extra taxes or prices, or accept cuts to one's standard of living to protect the environment. Willingness to pay more for environmental protection has decreased across a range of countries from 1993 to 2000 with the 'routinisation' of 'the environment' as a political issue. 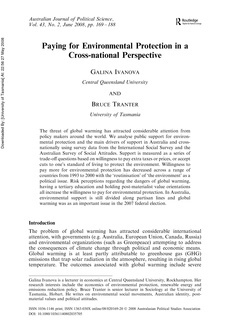 Risk perceptions regarding the dangers of global warming, having a tertiary education and holding post-materialist value orientations all increase the willingness to pay for environmental protection. In Australia, environmental support is still divided along partisan lines and global warming was as an important issue in the 2007 federal election.